The U.S. Federal Transit Administration (FTA) announced a total of USD 281 million funding allocations to five transit projects in Arizona, California, Minnesota, and Texas. Funding will be provided through FTA’s Capital Investment Grants (CIG) Programme. The projects included in the financing are the Tempe tram in Arizona, the Los Angeles Westside Purple Line section 3 project and San Diego Mid-Coast Light Rail project in California, the Minneapolis Orange Line Bus Rapid Transit (BRT) project in Minnesota and the Dallas Area Rapid Transit (DART) Red and Blue Line Platform Extensions project in Texas. The Tempe tram is a 5-km line with 14 stations and six vehicles that will connect downtown Tempe and Arizona State University. 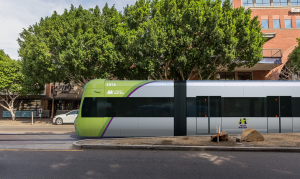 It also will connect with existing light rail serving Phoenix, Mesa and the airport. The total project cost is USD 201.9 million with USD 75 million in funding requested through the CIG Program. Upon final FTA approval of a construction grant agreement, the project will receive USD 25 million in FY 2018 CIG funds to complete the CIG funding request. The Los Angeles Westside Purple Line section 3 project is a 4.2-km heavy rail extension from Century City to Westwood and the Veterans Affairs hospital that includes two stations and 16 vehicles. The total project cost is USD 3.7 billion with USD 1.3 billion in funding requested through the CIG Program. Upon final FTA approval of a construction grant agreement, the project will receive USD 100 million in FY 2018 CIG funds. The San Diego Mid-Coast Corridor LRT project is a 17.6-km LRT extension from downtown San Diego to the growing University City area. The extension will improve access to employment hubs and numerous educational and medical facilities north of downtown. FTA announced a USD 1.04 billion grant agreement for the USD 2.17 billion project in September 2016. The project will receive an additional USD 80 million in FY 2018 CIG funds. The Dallas DART Red and Blue Line platform extensions project will extend and modify platforms along the existing Red and Blue Lines to accommodate three-car trains with level boarding. The total project cost is USD 128.7 million with USD 60.76 million requested through the CIG Program. Upon final FTA approval of a construction grant agreement, the project will receive USD 2 million in FY 2018 CIG funds to complete the CIG funding request.